"3LA1, V-2342" by Timothy K. Perttula and Robert Z. Selden Jr. CONTEXT INFORMATION: From a grave in a cemetery excavated by Horace McLendon in the fall of 1941. Associated vessels (from several graves dug at that time) include V-2343 to V-2365. DECORATION: The engraved motifs on the vessel body are delimited by four horizontal engraved lines at the top and bottom of the body; a red pigment had been rubbed in the engraved lines. The main motif on the body is repeated twice, and consists of a large engraved semi-circle or large ellipse with three distinct elements: a vertical hatched panel with two excised parabolas (and with two central small excised punctations) and one narrow oval (with a single short vertical engraved line within it); two sets of two vertical engraved lines; and two opposed hooked arm scroll lines attached to vertical engraved lines with short spurs or tick marks. The large semi-circles or ellipses are divided by two vertical hatched panels; these panels are nearly the same as the vertical hatched panels within the semi-circles or ellipses, except that they have two excised parabolas (with two excised punctations) and two narrow ovals with short vertical engraved lines within them. 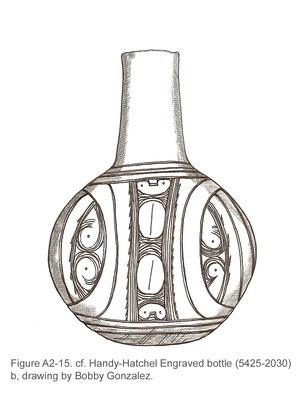 Handy-Hatchel Engraved bottle (5425-2030): a, photograph; b, drawing by Bobby Gonzalez.